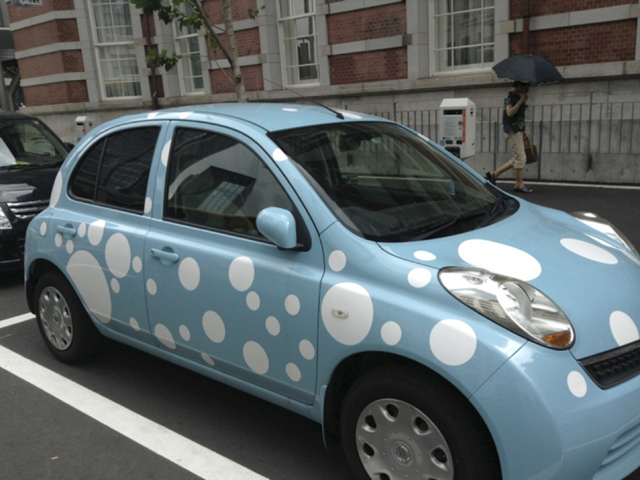 Spirals, spots, bubbles, splotches, the song of Blue & White is sung in circles. Designs are often round and spotty and go round in circles – like the world we live in, like the movement of our minds. 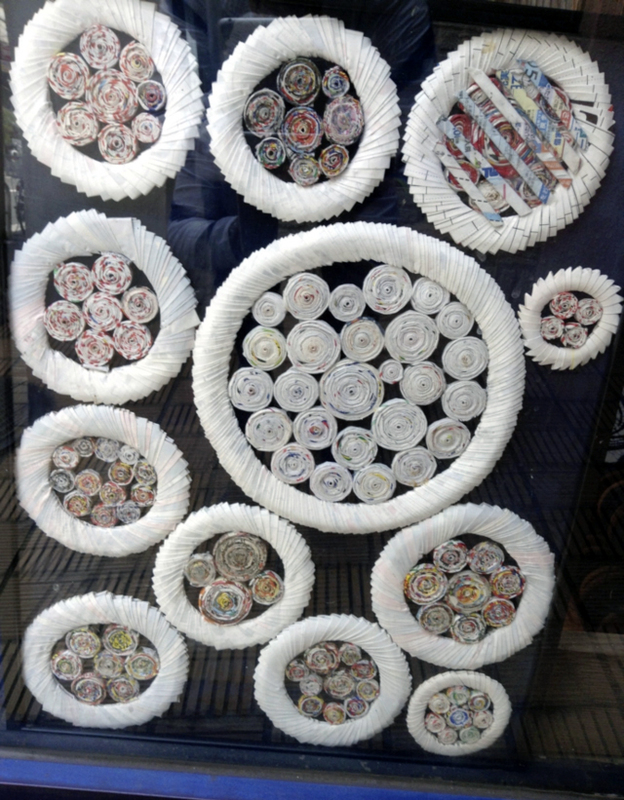 Above is a random collage of spiraled pieces of recycled flyers, wound and arranged by Katsutoshi Yoshikae, an 85 year old man in Kagoshima, Kyushu who sees the beauty of recycled flyers that he rescues and rearranges into spirals and circles. 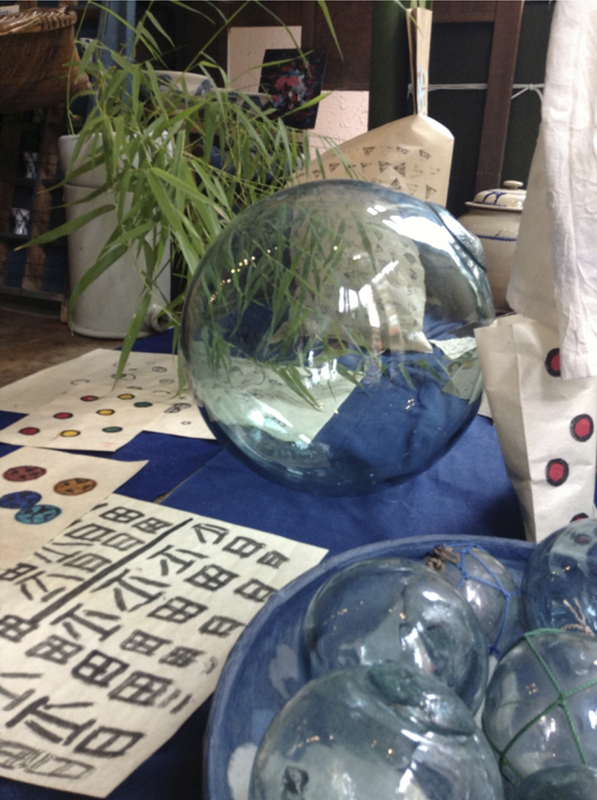 A collage that he made caught my eye in the studio of Takashi Tokunaga, artist husband of our incredible Sashiko artist, Tokunaga Miyoko, and he kindly made another for Blue & White. Though I had never thought of it, his spirals made me realize how much of Blue & White is circles going round and round. 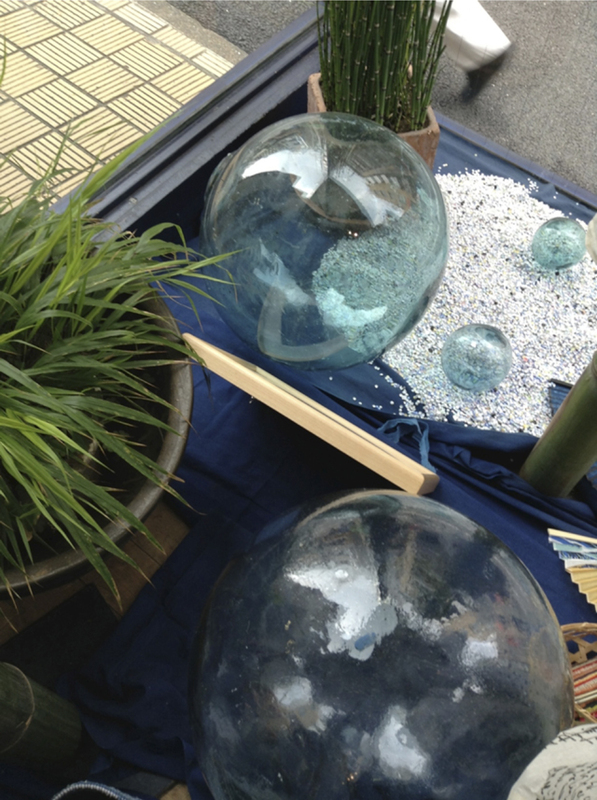 Ten large round and heavy glass fishing floats now sit in the window and take my breath away with their simplicity and beauty. 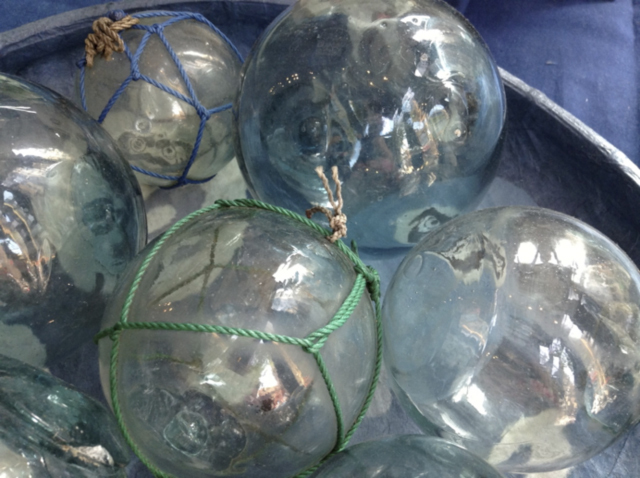 Captivated when I found them, I bought two or three boxes of the glass balls, each one slightly different in tone and size, many wrapped in fascinating structures of knotted twine. They reflect the light of the shop as they must have reflected the undulations of the ocean and the activities above and below. Here, the glass fishing floats nestle on a bed of round paper punches that are thrown out as trash in our paper processing neighborhood at home. For me they speak of the preciousness of things. 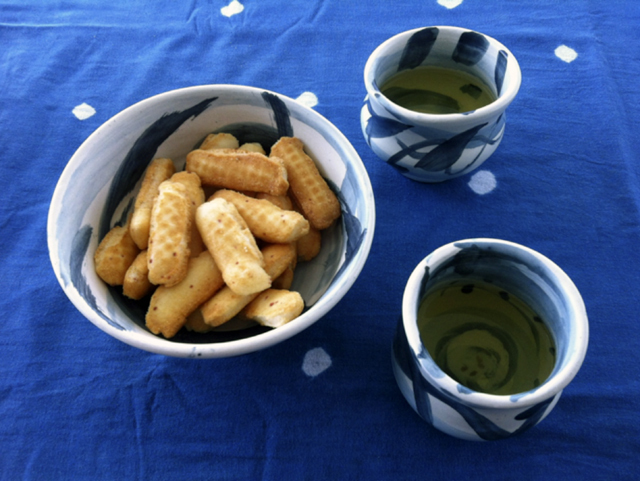 Mottainai! Everything can be used and reused. Too good to be thrown away. I rescue them regularly from the trash and put them to new uses in Blue & White. The floats go well with the Shobu Gakuen washi bags that have hand drawn circles on them. Everything going round and round! It’s summer! I found a whole cache of them in Nagano near our summer house and I couldn’t believe their purity of form and material. 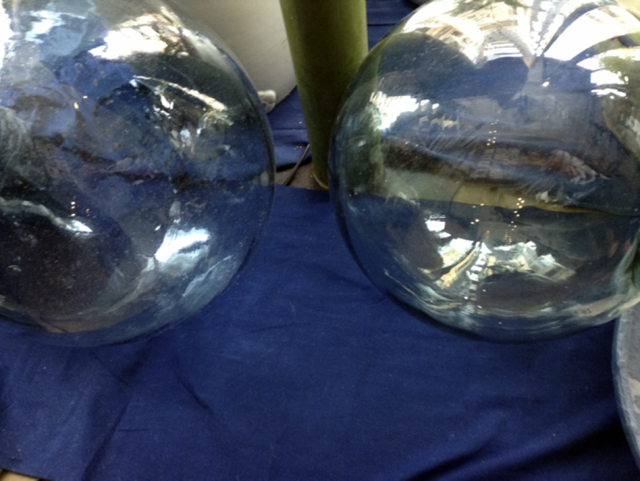 Huge reflecting bubbles frozen in glass! Bubbles have always intrigued me. From the wonderful bubbles that our children blew gleefully in the bath tub when they were little, to the bubbles the man from the sports goods shop on Patio Juban near Blue & White, creates by waving his large plastic wand, enchanting all passing children. Bubbles make us all children again. Suds seem to be pouring out of the 100 Otafuku in the wooden ofuro. The joy of the bath! 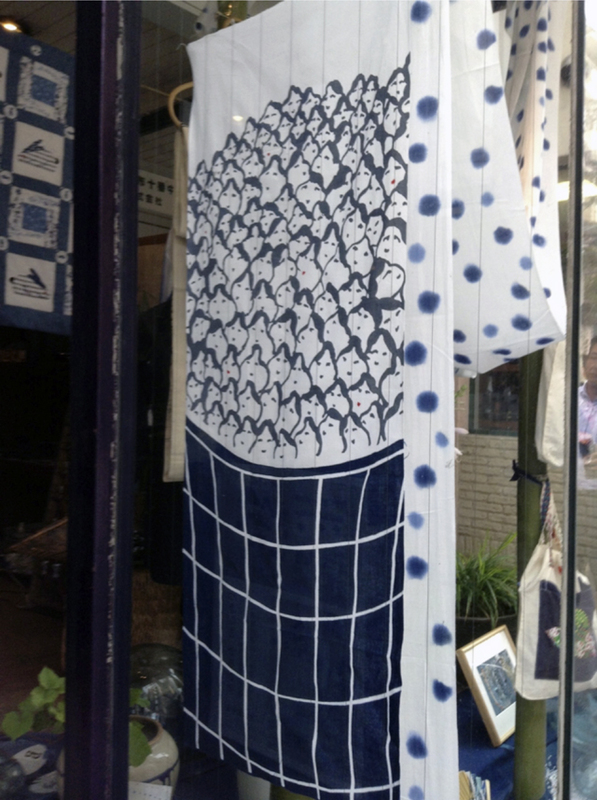 This is Blue & White’s newest whimsical tenugui, hand towel. Materials too echo the circles of Blue and White, though they are not always blue. 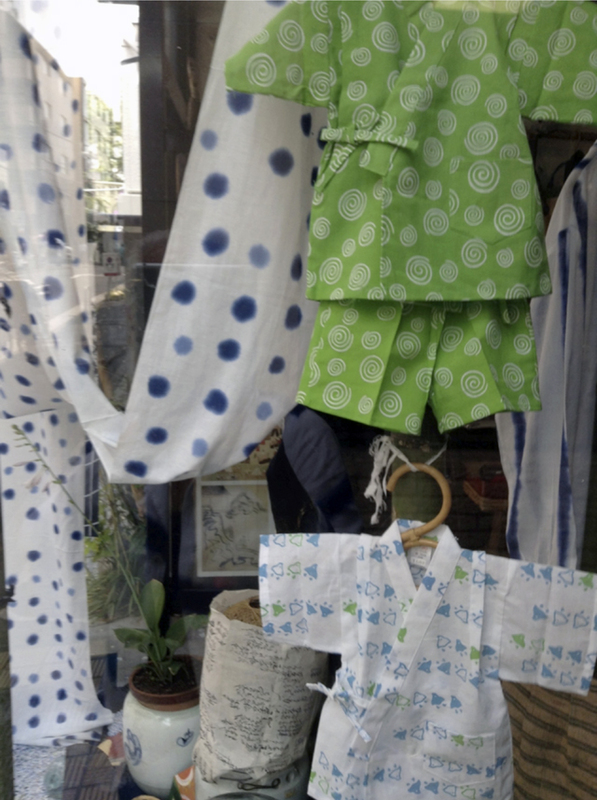 The green spirals of the child’s jimbei salute the energy of summer with their fresh stencil dyed whirls. The wonderful freehand dyed spots of gauze tenugui are the work of Abe san on Asahi Dyeworks who is always ready to try new ways of dyeing, in this case pouring dyes from dye watering cans through holes he has punched randomly through plastic sheeting, in response to our requests for softer and less rigid stencil lines. 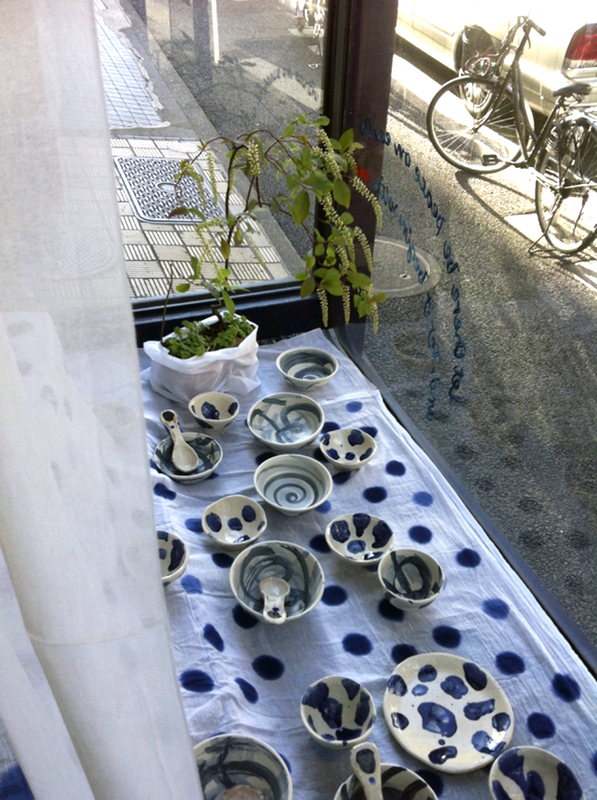 Spotted window filled with the free hand dishes and bowls of Yu Kobayashi, self reliant wonder woman who built her own house, and everything in it – furniture, paintings, mailbox, even a swing. She runs marathons, swims every morning in the ocean nearby and travels to Africa each year making friends and painting the life scenes that she meets. The circles and spots and spirals of her ceramics reflect her free life and free mind. 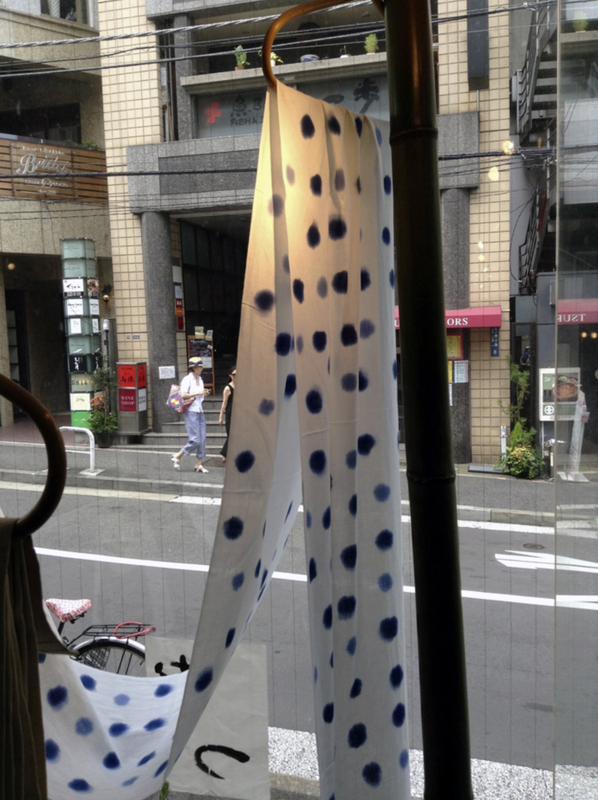 A 12 meter length of spotted gossamer gauze sends its cool message to the neighborhood. It is perfect used as a tablecloth, a stole, or a sundress, and we have even used them as a canopy over the deck on bright sun beaten days in the country. 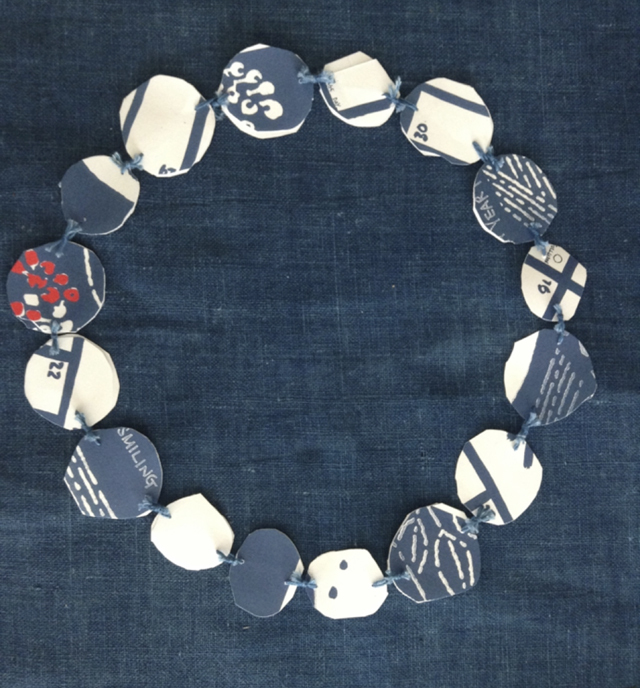 Our Smiling necklace, made of recycled cuts of old calendars, reflects just how round in circles we go. We will use it for our 2014 Mottainai calendar next year. But the ultimate spots before my eyes were parked in front of the newly renovated and magnificent Tokyo Station last week as I hurried to the O Edo flea market, held on the first and third Sundays of the month. I had to stop and photograph the 4-wheeled piece of art lest it be gone when I was done. Here was the last word in circles. always so good to feel connected to you. miss a good face-to-face day long walk and talk. Always fresh, always captivating! Always love your posts! Am missing the injection of inspiration & joy I always felt when visiting Blue & White fueled by your creative energy.